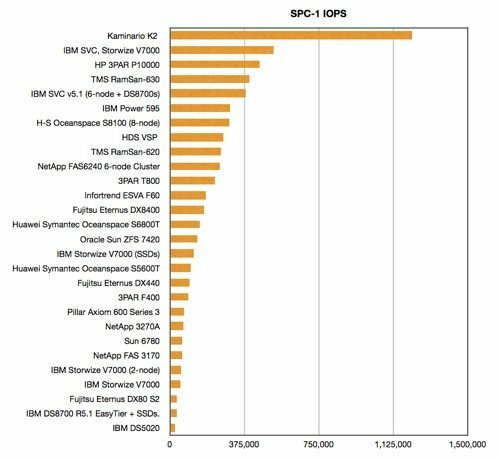 Solid state storage supplier Kaminario has grabbed the SPC-1 storage benchmark with the first million-plus IOPS score, a full 134 per cent faster than previous king-of-the-heap IBM. The Storage Performance Council 1 (SPC-1) benchmark aims to provide comparison performance numbers for a storage subsystem while carrying out operations for business-critical applications. For each tested system it delivers an IOPS score, an average response, a cost per IOPS and the total price of the tested system. Kaminario provides a K2 line of clusterable solid state storage systems using DRAM (K2-D), NAND (K2-F) with Fusion-io PCIe flash cards, or a hybrid DRAM-NAND system (K2-H). The K2-D is for write-intensive and latency-sensitive applications. It submitted a grid of K2-D nodes to the SPC-1 benchmark and recorded 1,219,973.91 IOPS (PDF) – more than twice as fast as the IBM SVC and Storwize setup that scored 520,043.99 IOPS at the end of January, the first system past half a million IOPS. What's happened is that a 282TB disk-based storage system was bested by a 1.2TB mirrored, all-DRAM storage array. Why would we be surprised at that you might ask? It would be mighty strange if it didn't. In effect it's like having an in-memory database. The K2-D system comprised three K2-D enclosures configured as a single array. It contained 15 IO directors, 33 DataNodes (30 Active), with each one being a server with its own solid state media and backup module. This was connected over Fibre Channel to 10 host servers running the SPC-1 workload. The Kaminario kit cost $490,760 which compares to the cost of the IBM SVC/Storwize setup of $3,598,956. It's not even a fair competition; the Kaminario kit cost seven times less, ran more than twice as fast and its average response was 3.44msecs, less than half IBM's 7.39msecs. Disk-based arrays will be decimated by DRAM solid state arrays. Flash solid state arrays are having a harder time competing against the most efficient disk systems; look at the chart to see how TMS RamSan systems are beaten by disk-based arrays from HDS, HP and IBM. The RamSans have a significantly lower response time though. The SPC benchmark was conceived when solid stare arrays were exotic products and it was effectively a way of comparing disk drive arrays. This Kaminario result is so far beyond the reach of ordinary disk storage arrays from EMC, Dell, HDS, HP, IBM, NetApp and others that it's unreal. Why should they even bother trying to compete against networked DRAM storage? If you want hundreds of thousands to a million plus SPC-1 IOPS performance and only need a few terabytes of networked storage capacity, then Kaminario or TMS are your suppliers. They blow everyone else away. For higher capacity levels you can add more Kaminario storage nodes or TMS modules and retain a cost advantage. But, if you are heading into the multiple tens of terabytes area, then it's disk arrays you need to look at, perhaps performance-boosted with flash caching or tiering.